In the second cantica of the Divine Comedy written by Italian Poet Dante Alighieri, the author describes in great detail a trip through the seven terraces of Purgatory. Mid-way through the 5th Terrace the poem's hero finds himself surrounded by the souls of the covetous, folks who have sinned through embracing things in an unhealthy way. Here in Purgatorio, owners of Porsches, BMWs, Alfas who have neglected their families and friends, are stuck in slushbox equipped Plymouth Reliants on freeway on-ramps. The on-ramps are equipped with traffic metering systems that seem to be functioning, but nobody ever merges onto the freeway. This is one of those rides. Find this 1985 Plymouth Reliant in impeccable shape offered for $1,499 in Woodland Hills, CA via craigslist. 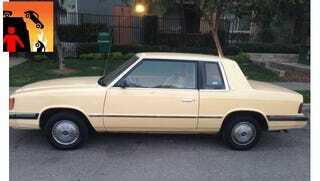 Originally posted as 1k: Automotive Purgatory: 1985 Plymouth Reliant on Daily Turismo.